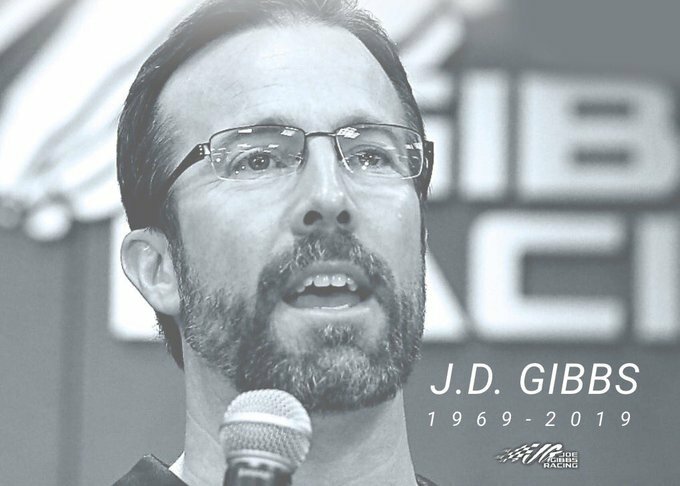 Messages of condolences and memories have been pouring out of the NASCAR community following the death of J.D. Gibbs at 49, after a long battle with a degenerative neurological disease. Gibbs was the co-founder, with his father Joe, of Joe Gibbs Racing. Denny Hamlin tweeted, "His car. His number. His signature above my door. I will always be grateful for what His family did for mine and the opportunity he gave me 14 years ago." Kyle Busch tweeted, "Thank you for giving me the opportunity to succeed and for guiding me along the way. We won together and we lost together, but you had a way to light up a room and bring peace to all. It was truly an honor to call you a friend. Love you JD." Dale Earnhardt Jr. tweeted, "What an incredible person. So very kind and humble. Thinking of the Gibbs family and all his friends at JGR." Jason Dean Gibbs was born Feb. 21, 1969, near Los Angeles as his father served as assistant football coach at the University of Southern California. His upbringing included plenty of moves, according to a team biography, as his father was hired as an assistant at Arkansas before reaching the pros with stops at St. Louis, Tampa Bay and San Diego. But it also included a pursuit of speed, with J.D. and his brother, Coy, taking an interest in go-karts, jet-skis and motorbikes in their young age. Before following his father’s career arc into motorsports, Gibbs pursued another of his father’s passions in football. The younger Gibbs played defensive back and quarterback at William & Mary from 1987-90, then transitioned to join his father’s race team after his college career. Joe Gibbs Racing formed as the elder Gibbs was wrapping up his first stint as coach of the NFL’s Washington Redskins, a tenure that yielded three Super Bowl wins. Joe Gibbs Racing hit the track in 1992 with a staff of 17 people operating out of a 5,000-square foot shop. J.D. Gibbs was a tire-changer for JGR in its earliest years, which included a breakthrough Daytona 500 win with Hall of Famer Dale Jarrett in 1993. Back then, the younger Gibbs still thought his future was in football, becoming a fixture on the sidelines as his father had done. Gibbs attempted a limited schedule in Xfinity and Camping World Truck Series competition, during the same time that he moved into an administrative role with JGR, becoming its team president in 1998. He tested for the first time at Darlington Raceway in March of that year, with plans to run 8-10 races later in the season. Gibbs’ brief audition behind the wheel was less than successful. Later in his life, he was able to make light of his driving days with self-deprecating wit. “If it was just me, I could be a pretty good racer,” he told The Washington Post in 2004. “But then you put 42 other cars out there and that causes some issues.” He also quipped at a convention with sponsor Interstate Batteries in San Francisco in 2014: “My dad, he fired me in a nice way,” Gibbs said, with his father and driver Kyle Busch alongside. “He gave me an office and said, ‘hey, you’re now the president, because you’re a horrible driver.’"
J.D. Gibbs’ competitive spirit translated into his management style, fueling a period of dramatic growth for Joe Gibbs Racing. The organization expanded to a two-car team in 1999 and quickly snared its first two championships — with Bobby Labonte in 2000 and Tony Stewart in 2002. When his father rejoined the Redskins in 2004, bringing Coy Gibbs with him as an assistant coach, J.D. Gibbs was solely in charge of JGR’s day-to-day operations. J.D. said he was initially concerned for the added responsibility, but lauded the foundation that his father had established. Even then, he had plenty of support from within the organization. One year later, the team had expanded to a three-car effort, highlighted by a second premier series title for Stewart and the debut of Denny Hamlin, who remains with the team as JGR’s longest-tenured driver. Joe Gibbs resigned from his second NFL coaching tour in January 2008 after taking the Redskins to two more postseason appearances, rejoining his son in JGR’s senior management. Together, they navigated another season of change, adding Kyle Busch to the driver roster and shifting manufacturers to Toyota. The younger Gibbs was also instrumental in forming the JGR Diversity Program in conjunction with his father and the late Reggie White, an NFL Hall of Famer. That initiative groomed Aric Almirola for a career in NASCAR’s big leagues and continued with the ascension of Mexican-born standout Daniel Suarez to the Monster Energy NASCAR Cup Series ranks.